There’s no denying that the contingent workforce market is being disrupted by multiple forces – the emergence of statements of work (SoW) and independent contractors (IC) as significant new spend categories, the rapid evolution of analytics and supporting technologies, and rising buyer demand for total talent acquisition, to name just a few. Navigating through the maze of disruptions to rise to the top of the market is no easy feat for service providers in the space, but several have done so in 2017. Following are the differentiating qualities and capabilities that earned a handful of providers their rightful spot as Leaders in Everest Group’s Managed Service Provider (MSP) PEAK Matrix™ in 2017. Fast, proactive responses to market trends: With SoW and IC emerging as new spend categories, the Leaders have differentiated themselves by taking early action in acquiring the capabilities needed to manage them. After starting out with the low hanging fruits such as payments, compliance, etc., these Leaders are now moving on to strategic areas of the value chain such as sourcing, category expertise, and negotiation. The Leaders are also making considerable headway in the emerging area of Total Talent Acquisition (TTA) by developing the requisite capabilities and leveraging their existing expertise in RPO and/or as an Managed Service Provider. Technology ecosystem versus discrete technologies: The Leaders understand the need for and benefits of a talent ecosystem, which means offering an integrated set of tools that can help provide visibility and control over the entire talent acquisition function. These service providers have either developed or are in the final stages of developing a holistic technology architecture to serve the entire talent acquisition landscape. A prime example of this is the addition of SoW and IC management capabilities to the existing Vendor Management System (VMS) itself. Next-gen analytics capabilities: While reporting and descriptive analytics have been around for a while, the true business potential of analytics technology can only be unleashed through predictive and prescriptive analytics. When you couple these with natural language programming (NLP) and artificial intelligence (AI)/machine learning (ML), you create an easy-to-use, intuitive system that can greatly reduce the costs and spend associated with contingent labor. While the technology is still in nascent stages, the Leaders have started taking a few tentative steps down the road to acquiring these capabilities. Capability to serve the entire market: the Managed Service Provider market is no longer restricted to certain geographies or large enterprises. Buyers from developing markets and mid-sized firms are starting to embrace and realize the benefits of an outsourced contingent workforce management program. The Leaders have introduced specialized offerings, such as evaluating the need for a contingent workforce management program and advising in the technology implementation stage, that make it practical for these first generation buyers to outsource their contingent workforce management. Value-added services and customized solutions for experienced buyers: With a significant portion of their portfolio now consisting of second-and third-generation buyers, the Leaders have begun offering value-added services such as contingent talent branding and talent community management, which helps improve the candidate experience and results in better fill rates and acceptance ratios. They are also offering innovative payment models such as gainsharing or risk sharing programs, such as indemnification of contingent workforce management services. While the Leaders in our 2017 Managed Service Provider PEAK Matrix™ have taken considerable steps to gain the title, the market is still wide open for innovative and proactive providers. Investing in new technologies and capabilities, and quickly addressing market trends will help other providers emerge victorious. Talent acquisition teams across companies and countries have spent decades looking for a utopian talent acquisition solution through which they can find the right talent, at the right time, in the right place, and at the right cost. This rare, elusive combination may just start becoming a reality in 2017, as promising themes from 2016 begin to emerge on the mainstream, and new technologies and ideas surface. Integrating all these scenarios into one single solution offering might feel like fiction, but Everest Group feels it will start manifesting into reality later in the year. Enterprises and providers alike have been using video interviewing, self-scheduling, and background screening tools for quite some time. Other more advanced technologies such as AI, cognitive, predictive analytics, and NLP-enabled tools are evolving fast. And service providers that are the flag bearers of innovation in RPO are already investing in and working on some of these technologies. It will be interesting to see which service provider is able to integrate all these technologies into a one-stop solution, whether through new investments, or through partnerships and acquisitions. But, one thing is certain: this whole ecosystem is about to be disrupted, to such an extent that we believe that 2017 will probably be remembered as the year in which the concept of technology became deeply entrenched in the talent acquisition function psyche. This will also result in technology slowly becoming an extension of a recruiter’s physical being in the years to come. For more insight into some of these technologies, please see our reports including Technology in Recruitment Process Outsourcing – Enabling a Paradigm Shift, and Giving Talent Acquisition the “Analytics Nirvana” Edge. The economic downturn following the financial crisis of 2008 forced companies to look at their internal costs and find ways to rationalize spend on various business activities. Recruitment was quickly identified as an area ripe for significant cost cutting, and in subsequent years Recruitment Process Outsourcing (RPO) was widely adopted by enterprises. While cost reduction had long been RPO buyers’ main aim, in recent years they’ve been facing another set of problems – talent shortage and hard to fill roles. Employers are always on the lookout for better candidates with niche capabilities. However, these desirable employees can be hard to find, especially in a timely manner. To fulfill their hiring requirements, many employers hire contract or offshore recruiters. Unfortunately, hiring additional contract recruiters results in additional expenses, and offshoring results in loss of personal touch. And in both cases, the recruiters spend a substantial amount of their time on transactional tasks, rather than on professional recruiting activities. The answer to this problem is robotic process automation (RPA). RPA is being used to automate a wide variety of repetitive, low touch recruitment-related tasks and processes including data entry and validation, file and data manipulation, multi-format message creation, web scraping, text mining, workflow acceleration, etc. Through RPA, the productivity of the recruitment team can be improved manifold, resulting in better and faster hiring. 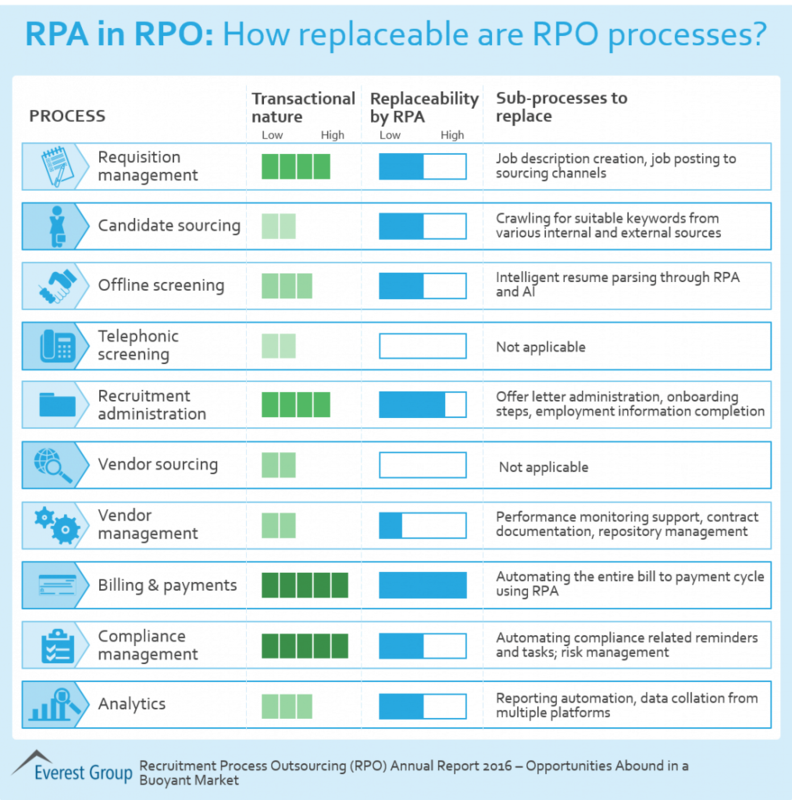 There’s little question that RPA helps reimagine the whole recruitment value chain. RPO providers and buyers that make investments in RPA, and automation in general, thereby enabling their recruiters to handle the professional aspects of recruiting, will differentiate themselves by more quickly and efficiently identifying, securing, and onboarding the most desirable candidates. For more information on how RPA can improve various recruitment-related processes, please refer to Everest Group’s RPO Annual Report, 2016.